Want a break from the sightseeing and attractions? Venture to Batumi’s oldest attraction – the Batumi Boulevard. 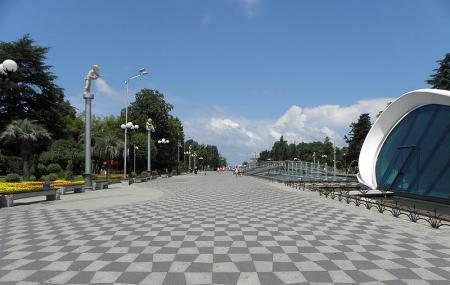 A lovely boulevard lacing the Black Sea, this one is full of opportunities for a great day to spend out. Its construction began in 1881, as a result of the then Governor’s assignment to a German gardener named Reseller, of creating a park, fringing the sea of Batumi Old Town. Stretching at about 7 kilometers, the boulevard today, is cleaved into two sections – the ‘new boulevard’ and the ‘old boulevard’, albeit the existence of the foremost park of the primary establishment. There are additions with new statues and sculptures, pews and fountains. The summer months from June to September being the best time to visit Batumi, is when the boulevard comes alive with buzzing cafes, restaurants, activities and several beach bars and clubs. Irrespective of the season, the boulevard’s historical monuments including a lighthouse, colonnades, and fountains don’t cease to beguile you. Strolling around with the fresh sea breeze whisking you, with the sound of waves’ splashing is a beautiful Batumi experience you can cherish forever. Add to this, the mesmerizing sunsets and you have a lifetime of memories right there. On foot or by bicycle or several buses from the city center. How popular is Batumi Boulevard? People normally club together Alphabetic Tower and Miracle Park while planning their visit to Batumi Boulevard.